In winning the 2016 Florida Derby, Nyquist banked $600,000 of the $1 million race purse and also received the $1 million bonus offered to any graduate of the Fasig-Tipton Florida sale to win the Florida Derby. What a payday! 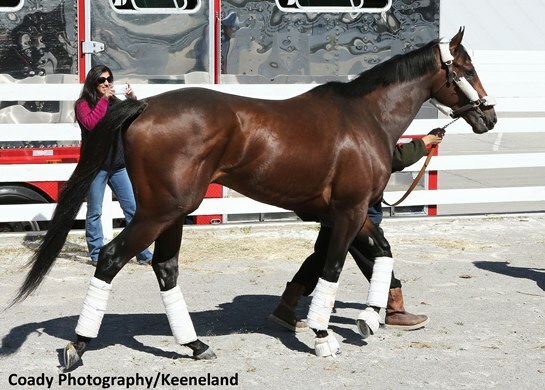 Sunday, Nyquist flew to Lexington, Kentucky and Keeneland Race Course where the undefeated son of Uncle Mo trained by Doug O’Neill for Paul and Zillah Reddam will do the majority of his training prior to the 2016 Kentucky Derby at Churchill Downs on May 7. Nyquist won the Florida Derby under regular rider Mario Gutierrez who won the 2012 Kentucky Derby with I’ll Have Another and Team O’Neill. Earnings for the $400,000 bay colt now stand at $3,322,600, but more important, Nyquist stamped himself as a clear-cut favorite in the 142nd Run for the Roses. “You’re always surprised when your horse wins as easy as he did,” O’Neill said. “But as quick as he broke and with an easy run to the first turn, we were very optimistic at that point. Tom Knust, the agent for Gutierrez, obviously has a vested interest, but the former Racing Secretary and a race tracker for 48 years cited three reasons for the dazzling performance by Nyquist in the Florida Derby. “He’s a great horse, Doug did a great job training him up to the race, and I thought Mario rode a great race,” Knust said. “You can’t ask for any more, that’s for sure. Nyquist is now training at Keeneland Race Course in Lexington, Kentucky and will be there until about 10 days before the Derby when he will take the 90 mile drive to Churchill Downs. Kentucky Derby Tours participants are very excited about the 2016 Kentucky Derby. Some quotes from Santa Anita Press release.